A more romantic spot for a holy well one could hardly find and as such it is one of my favourite sites. Tucked within a rocky chasm struck from the Pembrokeshire coast, the sound of sea birds crying, the wind whistling and the waves crashing forcefully on the rocks below; one could easily imagine oneself back in the time of the saints, when a new faith was brought into these heathen heartlands and changed them perhaps forever. A remote site and perfect for a hermit. To reach the well below and its romantic chapel, the modern pilgrim descends a long row of steps, said impossible to count and these enter this delightful chapel of St. Govan. No hard evidence can be found of the founder of this chapel. Some authorities identify him as King Arthur’s Gawain, but he is more likely to be Gobhan of Wexford as in the early medieval period there would have been links between the coasts. A legend tells that the saint journeyed to reach the family of St. David, the saint who trained him. Another legend identifies him as a repentant thief. Doubtless a chapel existed from the early times but the present algae covered chapel was built sometime between 1300-1500. Local legend tells that the saint was sent upon by pirates and at the spot the cliff opened up to form a cave which allowed him to escape and prevented them from reaching him. Another legend is that the saint’s hand prints were imprinted upon the chapel floor. A story tells that he had a silver bell which he placed in the chapel tower. It was stolen by the pirates but it was reclaimed by angels who encased it in a rock at the sea’s edge. It is a legend with is similar to that of St. Declan at Ardmore where his bell was left on the rock. When the saint died he was buried beneath the altar and indeed may still remain there. This cave formed the nucleus of the chapel and he survived on fish and water from two springs one within the chapel and the other covered in well house, both are now dry but the later is traceable. This holy well is tucked below the chapel almost blending into the boulder below is St Govan’s Well It is a small well house made of the nearby boulders and stones with a round rough roof. The chapel itself is said to be built over the springhead and local legend records it never flooded. The water cured lameness, eye problems and rheumatism and those cured would leave their crutches and walking sticks at the altar. Its waters were collected by a limpet shell by the faithful. However there are cures no more as if one looks inside we shall see nothing but small wave worn boulders. Despite the dryness of the well, the atmosphere of this rocky crevasse and its delightful chapel is worth the pilgrimage. 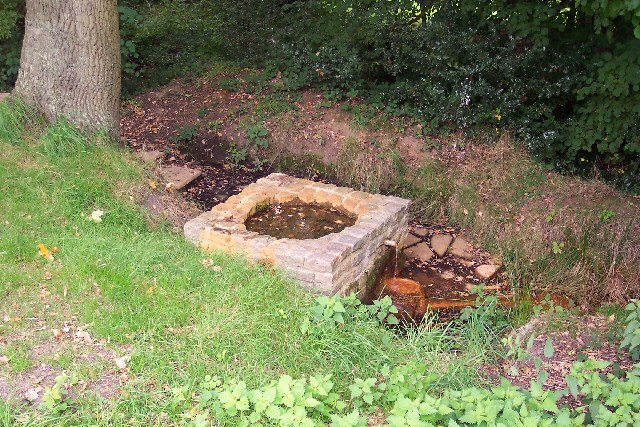 “…the water of which was once used for all the Christenings. It is not easily found, and local harvesters could tell me nothing about it; but I discovered it near a farm house a few hundred yards south west of the churchyard. Mr Baker (1985) in his Holy Wells and Magical Waters of Surrey records that his wife’s Grandmother was baptised here in the spring in 1876. Her mother would send her down to collect the water ‘to wash babies in’. It continued to be used for baptism until 1900. Visiting in the 1990s, it was pleasing to see the site still survived but in a sorry state, surrounded by an ugly brick and concrete structure. This was erected by the land owner a Mr. H. P. Lawson. He drunk a cupful of water every day and lived to 90! What was constructed is a considerable improvement. The stonework has been cleared and the water arises in a circular chamber fitted with a grill in the centre. The chalybeate red water flows from a pipe into a small circular basin and thence into a channel and flows into a brook. However, it is more likely it took its name from the church. still a broken hard drive!